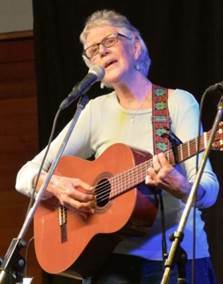 The next Goodwills’ Maleny House Concert from 2pm Sunday 10th July – is a Joan Baez tribute featuring Brisbane singer Christine Venner-Westaway and friends − Mick Donnelly (guitar), Sue Wighton and Mary Brettell (vocal harmonies). A stalwart of the Brisbane folk scene, Christine is known for her pure voice, emotive interpretation of songs and tasteful harmonies. Her ‘Joan Baez Tribute’ premiered at the Clennell Hall Folk Festival, Northumberland UK in May 2014. The show has since been performed at various Brisbane folk venues and at Perth’s Jackadder Folk Club. The Goodwills (Bob & Laurel Wilson) will perform an opening set and afternoon tea will be available. The concerts starts at 2pm. Ticket prices are $15/$12 concession. Limited seating, so bookings are essential. Call Laurel on 5435 2333 for bookings and directions. Goodwills house concerts are sponsored by the QFF.